We are pleased to report the Toledo Blade today has made up for overlooking an independent Northwest Ohio treatment center with two multiplace chambers. 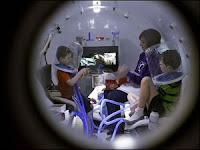 See our February 24 post, "Sara's Garden: Two Multiplace Hyperbaric Chambers in Northwest Ohio Before UTMC Toledo." In today's story, "Wauseon nonprofit delivers hyperbaric treatment," we learn more about the family origins and impressive commitment of Sara's Garden. And the more we learn the more we understand how the mindful practice of evidence-based hyperbaric medicine varies all across our community.